Pictured from left are Lee Thrush and Becky Jordan from enact Conveyancing, Harry Mills, Kathryn Shillito, Jenny Howard-Coombes, Charles Weeks of Iguana Developments and Rachael Milne of BP Chemicals. A group formed to bring together young business people in the Hull area has expanded its membership to more than 200 as it approaches its first anniversary. Harry Mills, Chair and a founder of Hull Young Professionals (HYP), said the group is going from strength to strength as a result of more established business organisations spreading the word about its activities. Kathryn Shillito, Executive Director of HullBID, said the group can play a key part in attracting people to live and work in Hull, and in encouraging students to stay in the city after graduation. 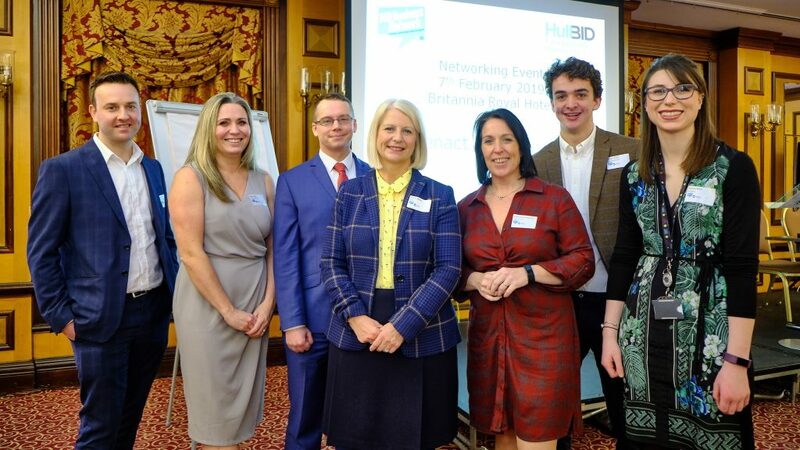 Hull Young Professionals and HullBID each provided speakers for the latest BID-funded networking lunch which attracted around 40 HYP members and around 15 guests from Hull College and the University of Hull to the Britannia Royal Hotel in Hull. The audience heard from fast-growing businesses including Iguana Developments and enact Conveyancing, and from Jenny Howard-Coombes, Executive Director and Joint CEO of Freedom Festival Trust. Harry, a solicitor at the Hull firm of Andrew Jackson, said HYP was formed in April 2018 to fill a gap in the market and provide professional and social networking opportunities for young people in business. The Institute of Chartered Accountants in England and Wales (ICAEW) Humberside and District has helped HYP with organisational support, and HullBID has assisted with introductions to city centre businesses. Membership of the group is free of charge and the aim is to keep event costs to a minimum by securing support from businesses. The group also takes a broad view on questions of age and members’ professions. Kathryn added: “Our objective is to project Hull city centre as a vibrant place to work, live and play and to keep young talent in the city. Our support for Hull Young Professionals is part of that. Be the first to comment on "Membership milestone for Hull Young Professionals"